Are you more of a group person or an individual? The reality for most of us is probably ‘a bit of both’. In a way this is one of the central questions in life – especially so for young people as they build their sense of identity between the expectations of others and their sense of being an individual. This tension between the community and the individual is something I was very aware of when the Indaba teams from the Dioceses of Gloucester and Western Tanganyika travelled to California in November. We realised how flimsy any preconceptions were which we may have had about people fitting neatly into groups (conservative – liberal, black – white, male – female). We could genuinely look around the group and see twenty-four unique individuals, all bringing something special to the make the group flourish. One of my special memories is singing our favourite song of worship. Somehow the faltering nature of the westerners’ Swahili added a real sense of communion – laying aside our inhibitions for the sake of joining together in worship. Another powerful experience was our visit to a project called ‘Our Daily Bread’ near San Jose. It was staggering to hear that this project to feed the local hungry (whoever may turn up) every Monday, Wednesday and Friday since the mid 1980s had recently served its millionth lunch! We had a glimpse into some of the personal stories which made up this community – which at first felt potentially threatening but was in fact very welcoming. As a traveller away from home you can feel very alone. In experiencing the grace of welcome and hospitality, I appreciated something of the church’s calling to serve our neighbours, whatever their journeys through this (at times, very lonely) world. 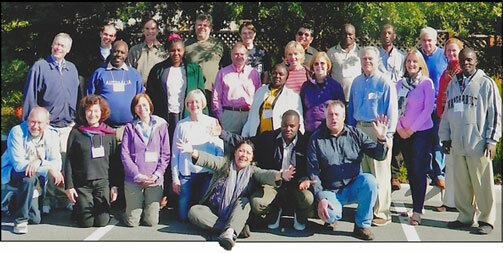 Later this month (20-26 February) we welcome our friends from the Dioceses of Western Tanganyika and El Camino Real – I pray that we would find that joy of welcoming the travellers – our companions. As we turn to think about Lent, I was struck by the way in which it combines that sense of being an individual and part of a community. Before Jesus goes into the wilderness he is baptised by his cousin, hears the voice of his heavenly Father, and the Holy Spirit descends on Him. Jesus is reminded of His identity rooted in divine community which enables Him to move into that solitary wilderness time. Meeting together through the Lent Course provides that opportunity to become rooted again in Christian community whilst we also focus on that deeply personal relationship with our loving God. May we all better know the God who is true community yet has made and knows each one of us as unique and precious. Posters are up in all our churches advertising this day, on 21st February, which is held in the Cathedral and runs from 10.00am to 3.30pm. The title this year is ‘Led by the Spirit in the Wilderness’ and, alongside worship, silence, prayer stations and a sense of space, there will be three addresses, one by Bishop Sadock of Western Tanganyika, one by Bishop Mary of El Camino Real and one by the Bishop of Gloucester. Anyone is welcome to attend this free day. No booking is necessary. Bishop Michael is again asking us to ensure that our church buildings are prayed in every day during Lent. 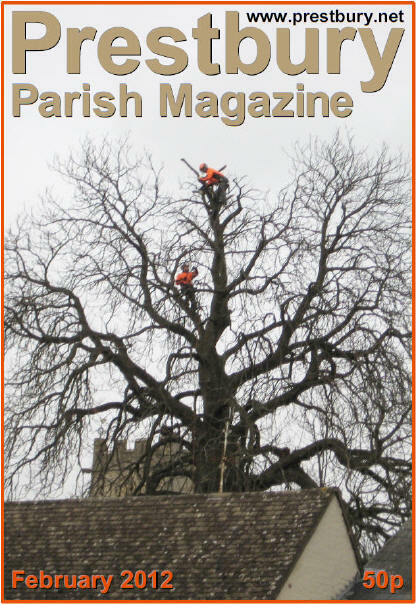 Our normal pattern of Morning and Evening Prayer and the Eucharist (as set out in this magazine) means that we only have to add one extra service, in St Mary’s on a Tuesday. This year we will again be using the service of Compline every Tuesday during Lent at 9.00pm. Compline, meaning ‘completion’, is a short service which draws the day to a close. Simple chants will be used with prayers and short readings. Why not decide to add an extra service to your pattern during Lent? ‘Taking something on’ is a good way of drawing closer to God during this holy season. This year’s Lent Groups will be ‘Transforming Life’, using study material produced by the Diocese of St Albans that follows the Old Testament readings for the Sundays of Lent. Groups will start during the week beginning 26th February. Please sign up on the lists now, to indicate your preferred weekday and time of day, so that we can begin to link hosts and leaders with prospective group members. We send our congratulations to Fr David who has been appointed to the post of Team Vicar in the Benefice of Richmond Team Ministry. 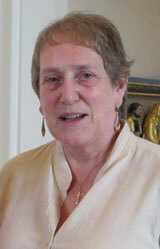 Fr David will be licensed by the Bishop of Southwark on Monday 30th April at 7.30pm in St Matthias, Richmond. We will be organising a coach to take people to the service. More details will be given in the weekly Notice Sheet. Fr David’s last Sunday here will be 8th April, which is Easter Sunday. There will be a ‘Farewell Tea Party’ in St Nicolas’ Hall from 3.30pm. This will be an opportunity for everyone from across the North Cheltenham Team Ministry to say ‘thank you’ and ‘farewell’ to Fr David and Sarah. During the afternoon, in addition to tea, there will be a time for presentations and (brief!) speeches. The afternoon will conclude with a short service of farewell and blessing. This will be the only evening service in Prestbury on that day but there will be time, if people wish, to attend Choral Evensong for Easter Day in either All Saints or St Lawrence at 6.30pm. Please put this important date in your diary! Thank you to all of you who have taken leaflets and are incorporating this project into your own prayers at home. We now invite you during the next three months (February, March and April) to come to church on the day on which your street will be prayed for. In St Mary’s there are services every day except Tuesday. 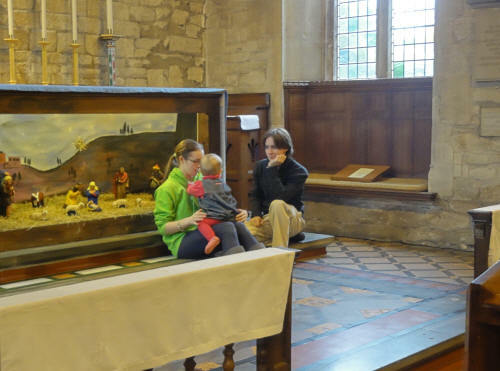 At St Nicolas’ there is a service every day (except Bank Holidays) with three on Tuesdays! Details of all services are on the back cover of this magazine. Some are early morning, some afternoon or evening; many are small and quiet, some large and noisy! The St Nicolas leaflet remains unchanged. We look forward to seeing you in church on your day if you can make it. See the full list. Messy Church® – for St Nicolas’? What is Messy Church? A contemporary approach to making a meaningful connection between families with young children and the church community. In 2004 near Portsmouth a vicar’s wife and a small team of supporters tentatively invited families with young children to a ‘non-churchy’ event on the premises because nothing their church offered at that time had grabbed the imagination of many of the local children. What they started was to grow into Messy Church, which now has spread to 900 localities in some 12 countries. That first Messy Church met and continues to meet once a month for about two hours and offers messy activities suitable for all ages from tiny people with their parents to people of any age who wish to be there. There will be a Christian theme woven through every session, perhaps a miracle or Moses or hope. In addition to the child-friendly creative activities there is time for worship and, most importantly, for a simple meal together. Lucy Moore (the vicar’s wife) and her team soon realised that it is critical to engage the whole family because we all need to learn together that Christianity is an ongoing journey together and not something you grow out of by the time you get to about 8 or 11 or 18 or any age. The work is now supported by the Bible Reading Fellowship and a number of publications are available so no-one needs to feel they have to ‘re-invent’ the wheel. I was thrilled and deeply blessed to be able to play a part in the initiation and setting up of Celebrate! at St Mary’s. We need to thank God for the connections made in Prestbury village between so many and the church there. As part of the North Cheltenham Team Vision process I put a question to you. Is Messy Church something that we could base at St Nicolas’ to grow similar links in that part of the Team? It is quite a big task but very much a team effort. Remember our God is a great God. He has gifted us as a church with people with many talents. When we seek to do His will He will provide us with what we need and more. There will be opportunities for food preparers to make simple meals like hot dogs, soup or pasta. Fund raisers might have coffee mornings. Washers-up will do what the label says. Some will lead a 5-10 minute worship time. Others may set up tables or clear away at the end. Musicians could give a lead for songs. Activity planners will get stuff ready and activity leaders help little hands stick things onto cards or cut something out. 'Messy Church Logo Copyright Bible Reading Fellowship© 2012. You may have noticed that all of us in the Local Ministry Team disappeared from view one weekend in November. Where were we and what were we up to? Well, we were at Glenfall House, learning to work together as a team. You may be surprised this was necessary, given that we have had a local ministry team in Prestbury for ages. Surely we have got the hang of it by now? But of course it was not that long ago that we had a ‘calling out’ for new members of the team. And, as any experienced coach will tell you, when even one member of a team changes, it is a whole new team. During the weekend we undertook a number of tasks using a structured approach recommended by the Diocesan local ministry experts. Some of the tasks were light-hearted. We constructed a beautiful and symbolic display from natural objects found in the Glenfall gardens, for use during worship on the Sunday morning. Other tasks were intended to be of practical use once we had returned home. We started to plan not just how we could let our congregations in Prestbury know more about what the Local Ministry Team is doing, but also, and perhaps more importantly, how we could enlist the active participation of more members of the congregations in the many aspects which make up our life as a church, so we grow in ministry together. And, by the way, if you didn’t notice that we were all missing on that weekend in November, that perhaps makes the point that we need to be more visible – look out for us, individually and collectively, in the weeks and months to come. Below is a reminder of who we are and what we look like. 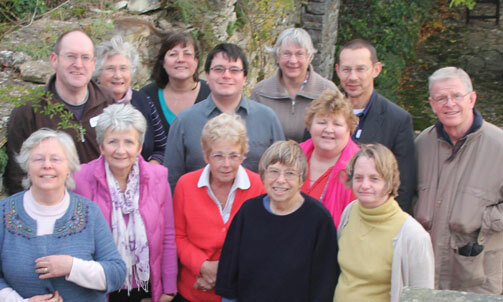 From left to right, back row: Fr Daniel Papworth, Margaret Holman, Miriam Barnes, Fr David Gardiner, Frances Murton, Jerry Porter, Fr Peter Brown. Front row: Sylvia McKenzie, Margaret Compton, Liz Greenhow, Beryl Elliott, Linda Biggs, Clare Wyatt. Fr Michael Cozens is also a member of the LMT, although not in the photograph. Representatives from the Indaba Teams will be joining us for worship at St Mary’s Church on Sunday 26th February for Celebrate! and the 11 o’clock services. On 12th June when I started my placement at St Mary’s six months seemed a long time and I would like to thank Fr Daniel and the Churchwardens for the welcome and on-going support that they gave me which in retrospect enabled the time to pass very quickly. I was glad to share in the life and worship of the church, particularly by joining in with the Local Ministry Team and the Servers and appreciate all I learnt from them. My time in Prestbury will inform my continuing reflections on my future ministry in the Church of England. I haven’t cut all my links with Prestbury as I am keeping up meeting with the Wednesday bible study group. Please join us for a special and extra coffee morning on Saturday 18th February where Julie Jefferies will be explaining how ‘Open The Book’ works and the benefits to our local community. This will take place at Prestbury URC from 10.00 until noon. There will be the usual mix of coffee, tea, cakes and good companionship! Our next meeting is on Tuesday 21st February at St Nicolas’ Church at 7.30pm. This will be our AGM and Eucharist, and Fr David will be with us. This year’s theme is ‘Let Justice Prevail’ and comes from Malaysia. Several services are being arranged in and around Cheltenham during the morning, afternoon and evening of Friday 2nd March. Details will be published nearer the time. This is scheduled for 10am at St Nicolas’ Hall and will be led by Beryl Griffiths, a well-known teacher and demonstrator. The event is aimed at church flower arrangers across the parishes, and offers a rare opportunity for individual help and inspiration, but should there be enough spaces, others are welcome too. The cost, to include tuition, coffee and lunch, will be £10 per person, and we are asked to bring our own flowers and foliage, details of which will be circulated nearer the time. To reserve a place, please contact me. As part of our Mothering Sunday celebrations this year, we would like to ask for your continued valued support in donating posies for our Sunday services. All posies can be delivered to St Mary’s on the morning of Saturday 17th March, where there will be buckets of water located by the font for you to place them in. For further information, please contact Becky Marks. We very much appreciate all your kindness in helping others to share the joy of Mothering Sunday. Our January bakestall raised £50 for Mission Aviation Fellowship (MAF), who are currently flying both workers and supplies to Sudan for World Vision and other charities. We are updating our list of bakers and hoping for new volunteers to replace some of our ‘old faithfuls’ who are no longer able to support the bakestall. Do think about joining us. This month’s bakestall for the N-Z team falls on Sunday 19th February. The alternative Christmas card at St Mary’s raised £152 for World Vision. Thank you to everyone who supported this scheme. In 2011 at the Thursday morning Eucharist at St Mary’s we raised £300, of which £100 was sent to Midlands Air Ambulance. The Finchcroft Lane Street Party kindly donated £25 to the Church in May, and this is included in the final figure. After the Eucharist we meet socially for a cup of coffee and biscuits and most people donate 50p for this. We supervise the coffee and we usually get various people helping in the kitchen and we do thank them for this. It has become a very popular service and we do welcome you to join us for this half hour service away from the bustle of everyday life. You are sure to get a warm welcome. We went along to this event to support the Scout group and Linda Jackson and her team. We managed to gather a team of six together and give ourselves a name. The ‘Allsorts’ tried their best with the many and varied questions on all sorts of topics. We were not the brightest team there but we did quite well. The quiz was very well organised and interesting. The raffle had great prizes and Nigel was delighted to win a voucher towards a meal at the Royal Oak. 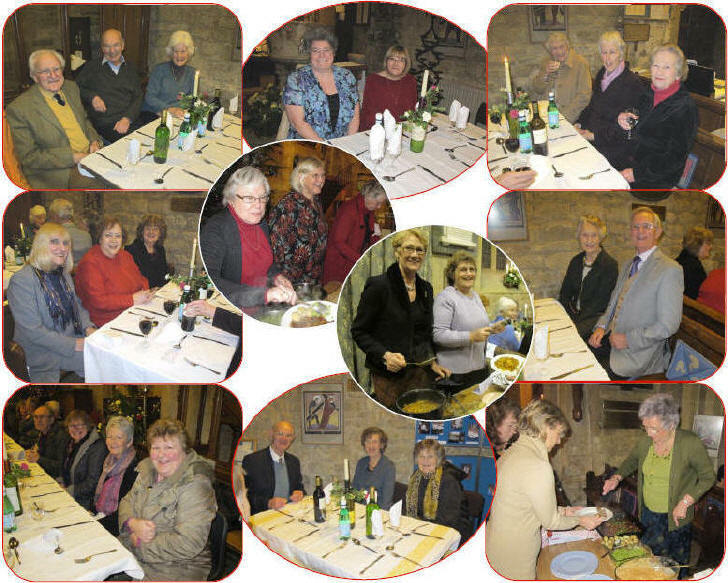 Well done to everyone who worked so hard to make this a most enjoyable evening, not forgetting the people who put on a good cheese and wine supper. Well done and keep up the good work and of course Scouting in Prestbury. Many of you will remember that a couple of years ago I undertook the John O’Groats to Land’s End cycle ride challenge to raise money for Prestbury and Pittville Youth. Not content to rest on my laurels, I am now intending to embark on another adventure – the Coast to Coast walk from St Bees on the Cumbrian coast to Robin Hood’s Bay on the North Sea coast near Whitby, a distance of approximately 200 miles. Walkers amongst you will probably have heard of Alfred Wainwright, whose life’s work was to map out and describe, with illustrations, Fell walks all over the Lake District; reprints of his books are still available. In addition he also traced out the Coast to Coast walk, which passes through the Lake District, then across the Yorkshire Dales and North York Moors. I am aiming to do the walk in May and I should be hugely grateful if you would feel able to sponsor me in my endeavour. This time I am intending splitting the sponsorship money equally between PPY and the Friends of St Mary’s, so watch out for me or someone from PPY or FoSMP waving a sponsorship form over the coming months. I shivered as I walked home. A cathedral is or has been a bishop’s church. In Ireland the diocesan system was agreed in the early twelfth century, but very many were set up, some serving very small lordships. No title has ever been extinguished, but mergers began very soon. 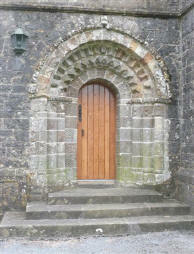 Cathedral architecture is usually as splendid as local resources at the time of building allowed, but few Irish dioceses were as prosperous as English or Norman ones. Moreover, centuries of warfare have meant destruction of buildings. 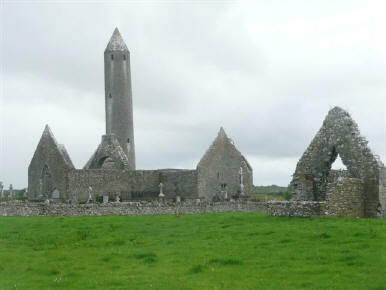 Several too were centred on isolated monastic sites, meaning both disendowment at the Reformation and few local inhabitants to assume support of the building. Some remain ruined, some were rescued from ruin in the nineteenth century, others were entirely replaced, often on village church scale, over the centuries. In addition Roman Catholic cathedrals began to be built shortly before 1800. In a summer visit to the slice of Ireland between Sligo and Limerick, I visited twelve cathedrals, eleven new to me, and a collegiate church. Several others in this area would have been worth a revisit had time allowed. Cathedrals whose architecture tends not to attract tourists usually open only for services, so I had to choose my dates and route to minimise the need to locate and disturb keyholders rather than minimising mileage. 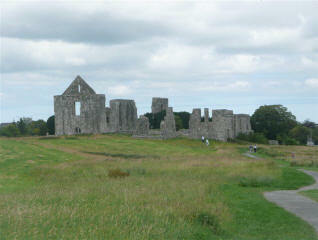 Some castles, archaeological sites and ruined friaries too were only open at certain times. 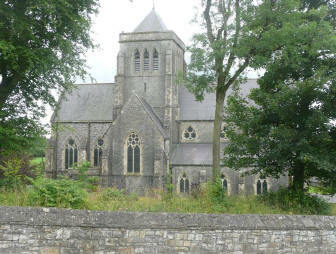 Kilmore cathedral, three miles from the border town of Cavan, is Victorian but succeeds the church of the 17th century Bishop Bedell, renowned for translating the Bible into Irish Gaelic. 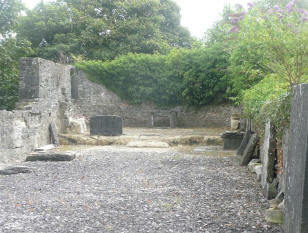 The site is ancient but there is now only a small residential area nearby. The settlement of Newtown Trim, a mile or so down-river from Trim, dwindled to nothing and the abbey/cathedral is a ruin. 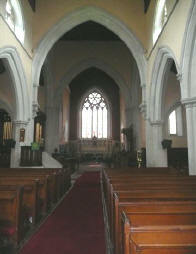 For centuries the Bishops of Meath had no cathedral, but in 1955 Trim parish church was promoted to cathedral. Having time before a tour of Trim castle, one of the largest castles in Ireland, I revisited Trim cathedral. 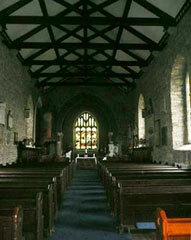 Sacked in the wars, the choir remains ruined but the nave was restored in 1660 and 1803. 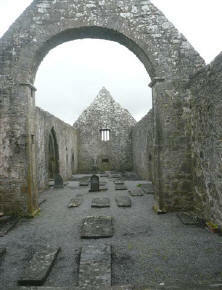 Elphin, county Roscommon, is a Patrician site, but the final cathedral was 18th century. 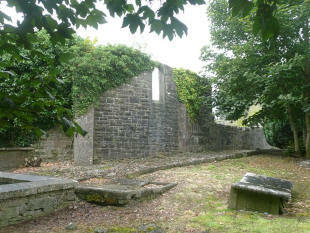 Wrecked by a storm in the 1950s, its status of cathedral was transferred to a church of similar date in nearby Sligo. 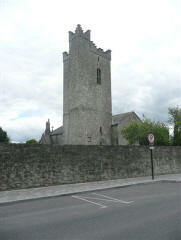 The memory of Elphin cathedral survives in the inn-sign of the Tower Inn beside the ruins. Sligo cathedral is too close to neighbouring buildings for me to photograph. The same problem occurred at Galway and Kildare; perhaps I need a wider-angle camera. Learning from the cathedral notice board that it was closed to visitors for repairs, I went to early Sunday Communion before travelling on but forgot to photograph the interior. A lot of work was clearly needed on the ceiling plaster and the Dean said that services would soon have to be held in the hall. Its website says work was completed in October. After leaving Sligo I visited the ruin at Kilmacduagh, county Galway, with Ireland’s tallest Round Tower. These verses are from the account of Moses’ powerful words to the Israelites effectively telling them that he will not be crossing the Jordan to the Promised Land with them. He reminds them of all that God has done for them on their journey, and what they must do for God in return if they wish to survive and prosper in their new land. The whole passage is impressive and, like so many parts of the Bible, can be put into context with our present times as they are told of the consequences of being ‘led astray to bow down to other gods’, much as we can be by the many distractions that our society offers! The words ‘Choose life’ jumped out at me one Sunday morning in church, whilst I wasn’t really paying full attention to the readings, and struck a chord that made me sit up and take notice! The words have stayed as a reminder to me when things don’t go the way I think they should and frustration begins to set in! To choose life then in all its glory is to live life to the full; to follow God’s commandments; to enjoy each day we are given for what it brings; to relish the challenge of being ‘different’ rather than melting into a background of mediocrity and sameness without a voice. It would be glib to believe that it is that simple, that to worship God makes all things better, rubs out all the pain and sorrow and makes us all shining examples of humanity. Of course this is not the case! There is so much depth of meaning hidden in these simple words and they become even more powerful when we consider Christians in those places of the world where to believe in Jesus Christ and to follow him can lead to terrifying consequences; where they are really choosing, in the literal sense, whether to live or to die; where following God’s commandments means standing out from the crowd and being different. Because life is not just the here and now but rather part of a journey where the final destination is not the end but just a new and better beginning; it is a bit like carrying the hope and expectation of Christmas inside you all year round and, as such, wanting to tell everyone else about it!